PN Futura » News » 3D Printing in End-Production: What's It Gonna Take? 3D Printing in End-Production: What's It Gonna Take? 3D printing and additive manufacturing (AM) won’t be replacing high-volume mass manufacturing anytime soon. But no one really expects that. Instead, these technologies have been making inroads in industries with high-value products that benefit from 3D printing’s ability to make them lighter, stronger, better, or just plain possible. High-volume mass manufacturing is usually aimed at consumer products for large OEMs, not products in industries already using additive techniques to make end-production parts -- like aerospace, medical, and high-end automotive. Some obstacles remain to AM’s advance into broader industrial use. 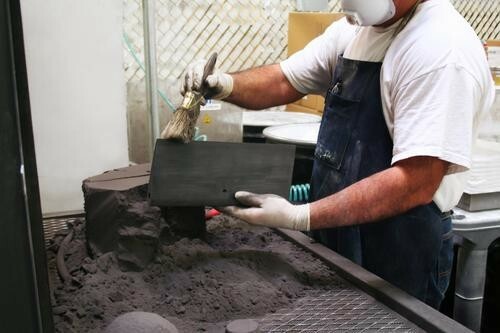 A finisher brushes away excess powder on a control surface built for unmanned aerial vehicles (UAVs). The part is made from NyTek 1200 CF, a carbon-filled material used for laser sintering. As many observers have noted, engineers need several changes. These include more and better materials in an open market, faster machines, more reliable processes and process control to ensure repeatability and consistency, several kinds of better software, and industry standards. They also need to toss out the traditional thinking about what constitutes both design and manufacturing constraints. The 3D printing industry shouldn’t be talking about AM. “Instead, we should be talking about what design engineers want to do and how to accomplish that,” said Tom Charron, vice president of product marketing for 3D Systems. “Don’t adopt the technology because it’s 3D printing but because it changes the game and what you want to do. Until recently, we’ve been in the hype phase.” The good thing that comes from all that hype is it gets people thinking and asking questions, such as, what does it really mean for your business? And how can you use it to make better products?